Your home is your sanctuary, it is your personal safe space from the outside world, and having your personal safe space invaded is an unsettling thought. 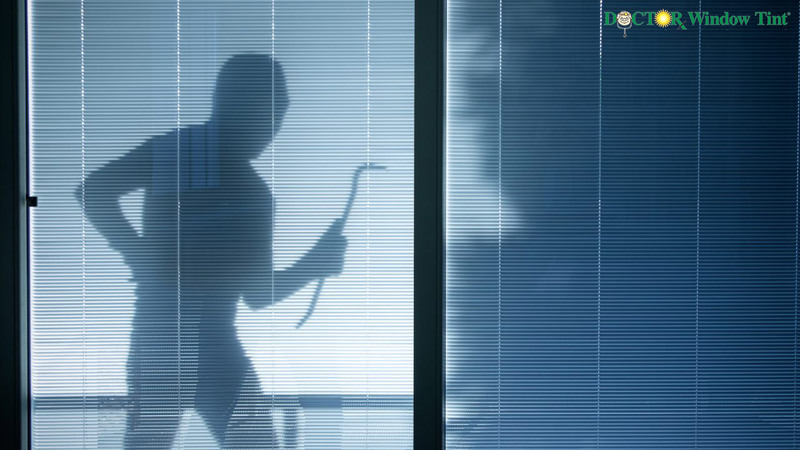 Regardless of whether or not the home invader or would-be burglar was caught, you’re often left feeling uneasy for a long time. Burglars are able to enter your home via your windows, especially if your windows are not tinted. Aside from the many benefits of residential window tinting, residential window tinting can also provide a layer of security that you may not have expected. Home window tinting is the perfect deterrent for any would-be burglars as your home is less vulnerable to a smash and grab style of burglary. Glass that shatters easily creates an easy opening for burglars that simply smash your window in order to grab the items they see. It can all happen so fast, you may not even be aware that your glass has been broken and your goods stolen until it’s too late. By improving the shatter resistance of your windows with window film, your window may be able to withstand impact with a fist or a metal object, if you are home this will give you time to alert the authorities as you will hear the impact of a fist or metal object against your window. The would-be thief will be unable to smash your window completely in order to take whatever may be in reach as the window film will prevent the glass from shattering. The appeal of a smash and grab is that it is a quick action with a high possibility of a quick escape, by having windows with a high shatter resistance; you delay this process for burglars. Hopefully before the would-be thief escapes your other household safety measures will be able to kick in which can lead to their arrest by local authorities. It may be great to let natural light stream through your windows, but it’s not as great when a burglar has a full view of everything that you own. By limiting the visibility through your household windows, you make it harder for thieves to see your household’s interior and reduce the risk of temptation. Remember that security film tints do not need to be pitch black in order to keep your belongings protected. It is specifically designed to provide you with the necessary protection while reducing the visibility from the exterior of your home and allowing natural light into your home. Your windows may have a slight tint to them but if you prefer no tint at all, you can opt for a clear security line tint instead. While having an alarm system set to go off if your windows are opened or broken may deter some burglars, it won’t stop others. Glass is easily breakable so locking your windows doesn’t do much to provide your home with protection and while your alarm goes off, your home invader can do whatever he pleases before the local authorities arrive. A security window film can help you rest easy at night, knowing that your household valuables are protected. If you’re interested in receiving all of the benefits as well as that extra peace of mind when you have security film installed. Don’t hesitate to contact the team at Dr. Window Tint. We’re a mobile window tinting company that has been serving the South Florida area since 1980. We are exclusive installers of Solar Control brand window tinting film. We take care of your panes, so you don’t have to! If you are looking to install window film in the home call us today at (305) 827-8468 or contact us.